During the 18th and 19th centuries Šurany was an important agricultural center and already by 1787 had 211 Jewish residents. 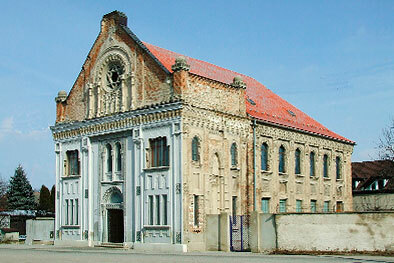 The Jewish community here was Orthodox, and until the Holocaust it formed one of the most important centers of traditional Jewish life in western Slovakia, noted for its yeshiva. In 1930 Šurany had 722 Jewish residents (11.3% of the total population). The Jewish community was prosperous, and 1932 it built a modern mikvah (ritual bath), which is located near the synagogue. In June 1944 most of the Jews of Šurany were deported to Auschwitz. Only 50 Jews lived in Šurany in 1948, but most of them soon left the country. No Jews live in the town today. Šurany's synagogue was built in 1916 in an architectural style that employs an eclectic mix of Gothic, Art Nouveau and Moorish elements – a mix that is vividly displayed on the decorative facade. After World War II the building was used for a time as a school. It now houses the Šurany Municipal Museum and has been open to the public since 2005. The museum has its permanent exhibition in the women’s gallery. One of the Museum's most precious exhibits is a fragment of a Torah scroll that was hidden for decades in the synagogue attic. The sanctuary is used for concerts and other cultural events. The building has been undergoing gradual restoration since the late 1980s. Its most interesting interior decorative features are the paintings using Star of David and pomegranate motifs that cover the steel-concrete cassette ceiling. The Ark no longer exists, but at the site where it was located now stands a memorial to Holocaust victims.